We Patel Scientific Instruments make Laboratory Autoclave are designed and fabricated for steam sterilization process to Kill micro-organism through the application of saturated steam under pressure to suit various I. S. standards application in the growing field of Medical, Agricultural Institution, Bio-Chemical Industrial, Research laboratories and Various Industries. We offer SS Cylindrical Autoclave which is of high premium quality and can be availed by us only. Our cylindrical autoclave is incorporated with water level indicator, vacuum breaker, automatic pressure control switch, and steam trap. 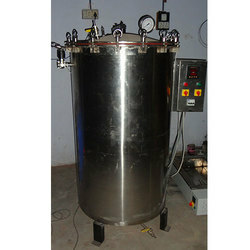 We are also well known cylindrical autoclave manufacturers in India. The unit has an outer chamber, inner Chamber, Boiler, and Jacket – all made of 304-grade Stainless Steel. For controlling sterilization cycle, a three-way valve or a multiport valve - made of S.S. is provided. It is supplied complete with vacuum breaker, water level indicator, steam trap and automatic pressure control switch. "PSI" make Vertical Autoclave are designed and fabricated for steam sterilization process to Kill micro-organism through the application of saturated steam under pressure to suit various I. S. standards application in the growing field of Medical, Agricultural Institution, Bio-Chemical Industrial, Research laboratories and Various Industries. Pressure Controller:Mechanically operated pressure/steam release valve. Heat Exchanger: The electrical heat exchanger transfer latent heat to the clean fill water to generated steam under pressure. Water Level Control: Low water level cut off electronic circuit protects the electrical heat exchanger from low water level inside the chamber, this Cut's off the power supply to the heat exchanger. 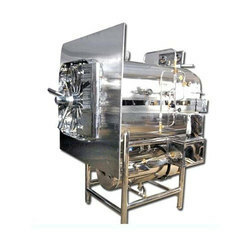 We are offering wide range of High Pressure Rectangular Horizontal Autoclave. Which are designed and fabricated for steam sterilization process through the application of saturated steam under pressure to suit various standards application in the growing field of Medical, Agricultural Institution, Bio-Chemical Industrial, Research laboratories and Various Industries. These product are highly demanded and appreciated by our client. This semi-automatic device controls the pressure inside the chamber mechanically and cuts-off the current from the heating elements, when the desired/ set pressure value level is attained inside the chamber and restarts the mechanism once the pressure inside the chamber falls from the desired level. This device is a safety device which protects the heaters from running dry. This device ensures that the machine is automatically switched off in cast the desired water level falls below the prescribed level.